We take heartburn seriously because we know how frustrating it can be when heartburn and indigestion get in the way of a good dinner with great friends. 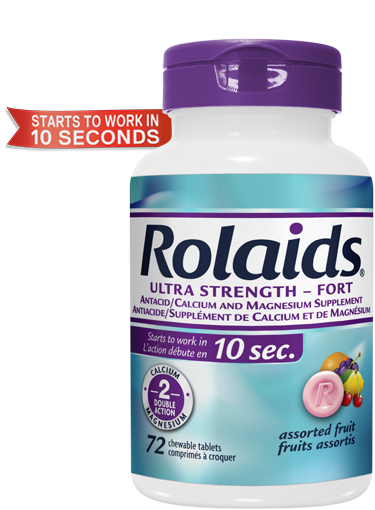 Take your heartburn relief seriously: ROLAIDS Ultra Strength Tablets with DOUBLE ACTION delivers the ultimate in relief from heartburn symptoms and starts neutralizing stomach acid to work in 10 seconds. *Contains 1000 mg of Calcium Carbonate and 200 mg of Magnesium Hydroxide - two antacid -neutralizing ingredients. Adults: chew 2-3 tablets as symptoms occur or as directed by a doctor. Do not take more than 8 tablets in a 24-hour period. Pregnant Women: chew 1-2 tablets as symptoms occur or as directed by a doctor. Maximum: 3 tablets/day. Adults and pregnant women: chew 1-2 tablets after meal or as directed by a doctor. Maximum: 3 tablets/day. In addition to being a fast-acting treatment for heartburn, magnesium hydroxide contains magnesium, an important nutrient the body needs for the proper growth maintenance and functioning of bones and muscles. The magnesium in ROLAIDS provides an and easy way to supplement this essential mineral for adults.